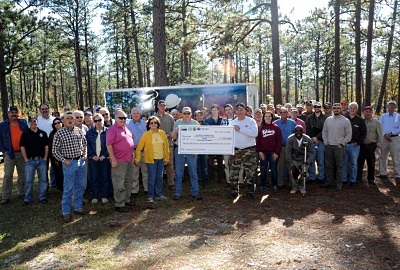 Landowners, forestry consultants, longleaf pineland lovers and prescribed fire enthusiasts gathered at the Carolina Sandhills National Wildlife Refuge recently for "Longleaf and Lunch," sponsored by the Sandhills Longleaf Implementation Team. The local area—including the refuge, Sandhills State Forest, and private lands—are one of the S.C. Quail Council's Bobwhite Quail Focal Areas. The Natural Resources Conservation Service and other members of the Sandhills Longleaf Implementation Team have had great success helping local landowners restore longleaf pine and groundcover through plantings, and bringing fire back into their landscape. Johnny Stowe, wildlife biologist, forester and Heritage Preserve manager with the S.C. Department of Natural Resources (DNR), spoke to the group, which included 37 private landowners, about burning the pineywoods. Generations of Southerners have burned the landscape to shape it to their needs, Stowe said, and he spun a tale of woods-fires in the Southland. Stowe also discussed specifics such as pyrodiversity, how to burn fire-suppressed longleaf stands without killing the mature trees, growing season burns and burning young longleaf. For more information on the benefits of prescribed burning, visit http://www.dnr.sc.gov/burningbenefits.